This evening I will just add a few photos but post the video tomorrow along with the remaining photos. Having stopped the “on this day” posting there is more time to try and carry on with more recent photos and videos. I spent some time at Small Heath and tried a new location to see the Polar Express, bit overgrown by trees though! Went back to the station after filming it. Link to photos for this date in gallery. Link to full list of loco/unit numbers. Link to Part 2. This entry was posted in "Mostly Midlands" gallery, Photo Galleries on December 13, 2018 by Sharpo. 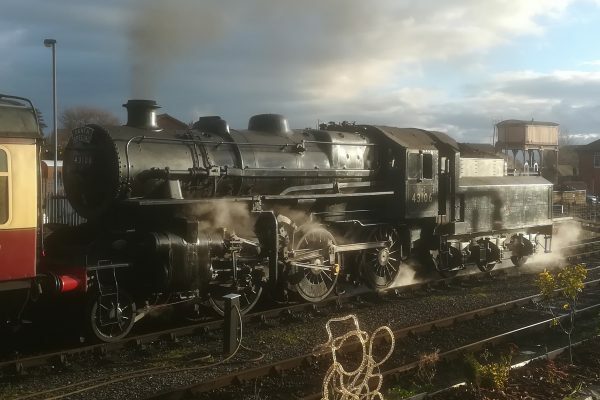 This entry was posted in Photo Galleries, Severn Valley Railway on December 9, 2018 by Sharpo. This entry was posted in Photo Galleries on October 24, 2014 by Sharpo. Since changing my web host I have more bandwidth available, so I have added Lightbox, which is a Coppermine plugin. This allows a slideshow of the larger images, which is more enjoyable to look at than the intermediate images, which of course are smaller and not so clear. To try it, click on any of the intermediate images – this will then display that image at full size. Within the image you can click on the right-hand side to go forwards, or left-hand side to go backwards. To start the slideshow, click the “>” arrow in the bottom right-hand corner of the box. At the moment, only the main gallery is set to run Lightbox, hopefully I will add it to the other – if there are no problems. Hope you like it? NOTE, don’t forget the “F11” option to hide the toolbars at the top of the explorer screen, to give a larger picture area if your screen isn’t very big. Pressing F11 again will bring back the toolbars, well it works with my Firefox & Internet Explorer! This entry was posted in Photo Galleries on March 17, 2011 by Sharpo.